The grass roots biotech movement is in full swing in the New York area. 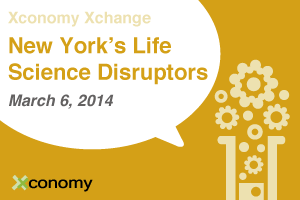 And in just a week, Xconomy will bring together some of the region’s most influential names to talk about it. On March 6, we’ll be hosting our latest biotech event, “New York’s Life Science Disruptors,” at the Apella event space at the Alexandria Center for Life Science on East 29th Street in Manhattan. It’ll be a series of interactive discussions with local life science experts spanning three key perspectives of the biotech ecosystem: industry, academia, and the investment community. 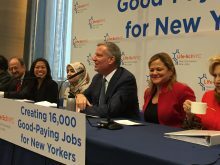 We’ll be getting to the bottom of the progress that has been made—and the big challenges that lie ahead—in fashioning a successful life sciences cluster right here in the New York metropolitan area. Today, we’ve posted the agenda for the event, which you can see here. We’ll be hearing from biotech luminaries such as Celgene’s George Golumbeski, Rockefeller University’s Marc Tessier-Lavigne, and the Icahn Institute for Genomics and Multiscale Biology’s Eric Schadt, among others. So be sure to grab your ticket—you can still take advantage of our student and startup discounts. Looking forward to meeting a lot of readers in person next week at the Apella.